Stocks ended Thursday mostly lower, hurt by disappointing earnings news. The Dow Jones industrial average (^DJI) fell 65 points, and the Standard & Poor's 500 index (^GPSC) lost 2, but the Nasdaq composite (^IXIC) added 4 points. Shares of Best Buy (BBY) were clobbered, dropping 29 percent. The retailer said a key measure of sales fell during the key holiday season. The company deeply discounting prices, but that hurt sales numbers. 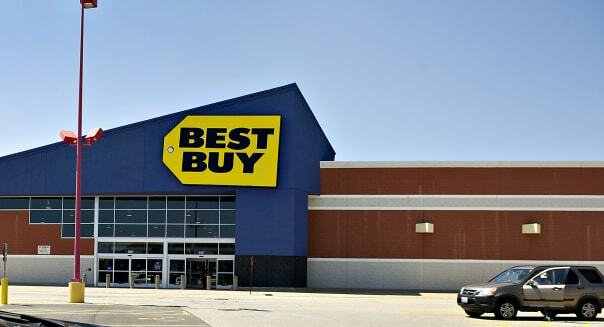 Best Buy stock was one of the market's best gainers last year, but it's off to a rocky start in 2014. The other monumental loser today was NuSkin (NUS), which tumbled 26 percent. China, which accounts for about half of the company's sales, is investigating whether it operates as a pyramid scheme. Herbalife (HLF), which has faced down similar charges of being a pyramid operation recently, lost 10 percent, even though its exposure to the Chinese market is not as large. On the earnings front, UnitedHealth Group (UNH) lost nearly 3 percent, even though earnings topped expectations and enrollments jumped. In the financial sector, Goldman Sachs (GS) fell 2 percent as earnings fell. Citigroup (C) lost more than 4 percent on weaker than expected results. But Blackrock (BLK), the largest provider of ETFs, gained 1.5 percent. Its net rose and the company hiked its dividend. The railroad giant CSX (CSX) derailed, losing more than 6 percent as net fell due to lower coal shipments. That dragged down other rail stocks. Norfolk Southern (NSC) fell 4 percent. In the online world, AOL (AOL) jumped 11 percent after agreeing to spin off and sell a majority stake in its local news network, Patch. (A disclaimer: AOL produces this report.) But Yahoo (YHOO) fell 2 percent after CEO Marissa Mayer fired the chief operating officer just a year after she hired him. And LinkedIn gained 7 percent, after it hired a respected Chinese executive to run its operations in China. Finally, there's a new clown in charge at the parent company of Chuck E. Cheese. The restaurant/entertainment chain CEC (CEC) gained 13 percent after agreeing to be acquired by Apollo Group. The Commerce Department releases housing starts for December at 8:30 a.m. Eastern time. The Federal Reserve releases industrial production data for December at 9:15 a.m. The University of Michigan releases its preliminary survey of consumer sentiment at 9:55 a.m. The Labor Department releases job openings and labor turnover survey for November at 10 a.m.